At some time, it is likely that most boaters may face a situation where you need assistance, if you run aground, have an engine failure, fire, leak or an injury to a member of your crew. Boaters use visual distress signals to attract attention in an emergency, either in the daytime or at night. Of course, using a VHF radio is another very effective way to communicate your situation to potential rescuers, but if your batteries are dead, visual distress signals may be your best hope. All vessels used on coastal waters or the Great Lakes on any body of water with a passageway to the sea at least two miles wide are required to carry Coast Guard Approved visual distress signals. These can be either pyrotechnic devices (flares) or non-pyrotechnic devices (distress flags or signal lights like the Weems & Plath SOS Distress Light). If you use pyrotechnics, that means you’ll need at least three daytime signals and three that are approved for night use for a total of six, or three that are approved for both day and night signaling. If you use non-pyrotechnic signals, you only need one approved for daytime and one night signal. 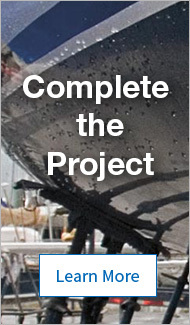 Must be Coast Guard Approved, in serviceable condition and readily accessible. If they meet the day/night requirement, you need three flares, minimum. In a real emergency, you’ll be glad if you chose to carry more than that quantity. They’re stamped with an “expiration date” of 42 months (3 1/2 years from the date they were manufactured). You can keep them after they’re expired as extra equipment because they usually will still work, but you can’t count them as part of the Coast Guard’s requirements in a Vessel Safety Check inspection. We recommend storing the flares in a container like the Orion Flare Canister. Meteor flares are propelled by black powder and launched from a pistol-shaped handheld holder. They reach an altitude of 375' to 500' and burn for 7-8 seconds. Rocket-propelled SOLAS parachute flares rise to 1,000' and burn for 40 seconds. Fire aerial flares after you have sighted or heard a potential rescue vessel. To attract their attention to your distress situation, the U.S. Coast Guard recommends that you fire two aerial flares - one immediately after the other - so rescuers can confirm the sighting and the direction of the signal. Handheld flares burn for one to two minutes. Orange SOLAS smoke flares are for daytime use only and are the best way for offshore boaters to show their location to rescuers searching in a Coast Guard helicopter. They float on the water’s surface and emit a dense orange cloud for three to four minutes. Handheld signal flares are intended as homing signals to pinpoint your position. The surface-to-surface sighting range on water is approximately three to five miles, depending on boat elevation. If a rescuer is five miles away and running at 20 miles per hour, it will take 15 minutes to reach you. Therefore, you should have at least 12 minutes (total burn time) of signals onboard to maintain a strong homing signal until help arrives. We carry a selection of Signal Kits geared for different types of boating—inland, coastal or offshore—that are packaged in waterproof storage cases and are much more economical than buying the items individually. 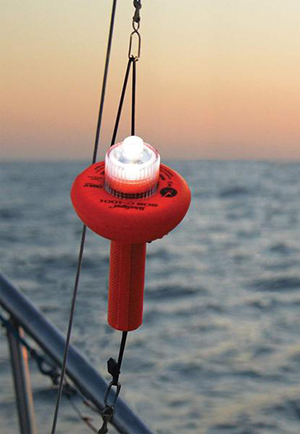 The Weems & Plath SOS Distress Light is a Coast Guard approved alternative to pyrotechnic flares. An orange distress flag is 3' x 3' square with a black square and ball on an orange background. It’s for daytime use only and is less effective at catching attention than a flare, except that it is not limited by a short burning time. An electric distress signal is approved for night only, and must carry the marking: “Night Visual Distress Signal for Boats Complies with U. S. Coast Guard Requirements in 46 CFR 161.013. For Emergency Use Only.” At this time (2018), there is only one device approved by the U.S. Coast Guard, the Weems & Plath SOS Distress Light. To meet the requirements for both day and night use, the SOS Distress Light is packaged with an orange distress flag. What are the pros and cons of the non-pyrotechnic alternative? Should you upgrade to SOLAS signals? Some categories of offshore boating activity have more rigorous requirements (commercial vessels and participants in offshore sailing races). A good source for offshore outfitting information is the World Sailing (WS) Offshore Special Regulations, which sailboat racers use to equip their boats for offshore racing. The WS requires many more flares than USCG minimum requirements, all of which must meet SOLAS requirements. SOLAS flares are a step up from conventional Coast Guard Approved pyrotechnic signals. They meet stricter standards set by an international safety organization (SOLAS stands for Safety Of Life At Sea). SOLAS parachute flares ascend to 1,000' and burn at a dazzling 30,000 candela for 40 seconds. Handheld SOLAS flares are waterproof and very bright, burning for one minute at 15,000 candela (compared to 700 candela for regular Coast Guard Approved flares). They also do not spray out molten material, unlike standard flares, so they’re safer to use, especially onboard a life raft. In some instances, SOLAS flares must be carried instead of conventional Coast Guard-approved flares. As mentioned above, sailboats participating in races organized under the International Sailing Federation must carry them and commercial fishing boats that venture more than 50 miles offshore must also carry a modest inventory of SOLAS flares, including three parachute flares, six handheld red flares and three smoke flares. Vessels operating from 3–50 miles offshore aren’t required to have SOLAS-grade flares, but we sure think it’s a good idea. Carry double the number of meteor or hand flares required: they’re cheap, and you’ll be grateful if you ever need to attract attention.